Lyn grew up wanting to live like her heroes, James Bond and Indiana Jones. She wasn't totally successful and never had to shoot her way out of a hotel bedroom. She's still coming to terms with it. Awards include: USA Today Bestseller and two Galaxy Awards. 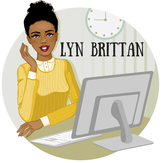 Lyn Brittan is the USA Today Bestselling author of the Mercenaries of Fortune Romantic Suspense series, featuring strong women and tough men who love them. She has won two Galaxy Awards for her Sci-Fi Romance series, The Outer Settlement Agency, while Book Riot and TwinjaBooks have both placed her Steampunk Mystery novel, The Clocks of London, on Speculative Fiction must read lists. For Review Copies (ARCs), click here. For a media/press kit and logo images, click here. Please note that some links on this site includes affiliate links to Amazon, iBooks, Barnes and Noble, Kobo and other retailers. Attending your first conference? Click here for tips. Are you a writer? Click here. 2015 October - Bouchercon, "New Crimes, New Faces"
Gryy Brown Press, click here. Liquid Silver Books, click here.